Returned home from Silverton last night. We had the most wonderful time at the Stitches in Bloom Quilt Show. As I said in my last post, I won this trip. 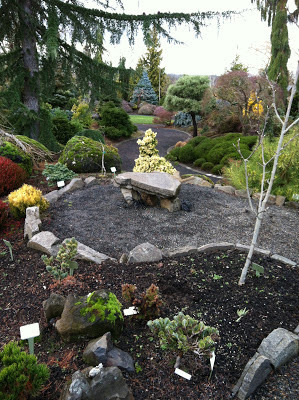 It included a nights stay at the Oregon Garden Resort, breakfast, lunch, a massage or pedicure for two, and entry to the quilt show of course. 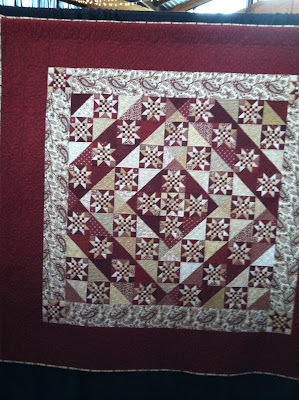 I told Mr. LB that I should get him a shirt to wear when he attends quilt shows with me - it would say, "I'd rather be fishing." He's such a gem. So, on with the pictures. I had to vote for this one because I am me:) She said it took her 16 years to complete it. This one is simplistic, but I like it for that reason and the craftsmanship was great. The flowers are needle turned. 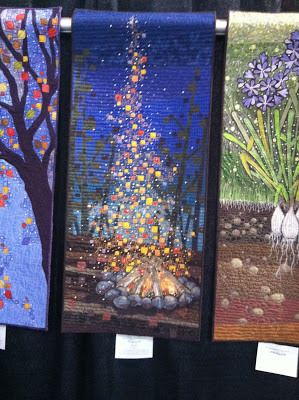 This one just impressed me as an art quilt. Those are little square pieces of fabric flying above the flames all quilted on in a geometric design. 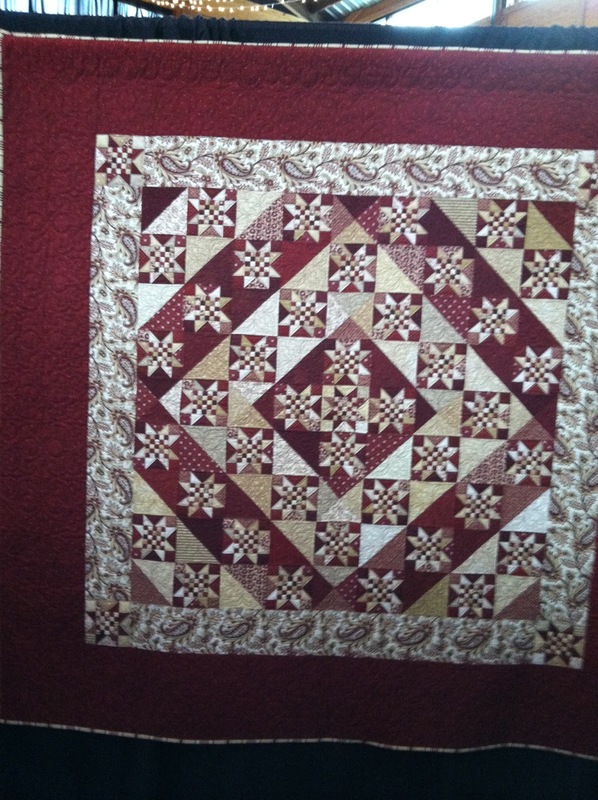 The quilting was all geometric on it - very interesting. And this one just had such nice quilting. 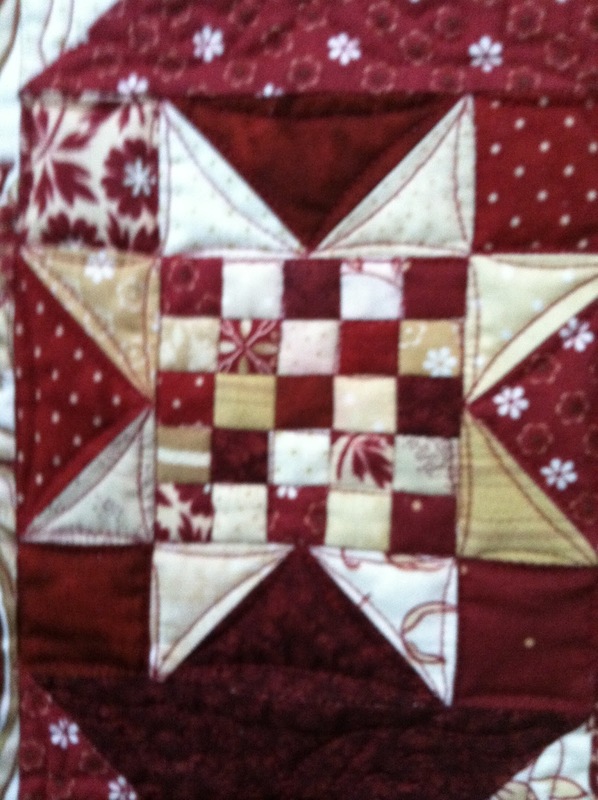 Oh but wait - Those are little 1/2 inch squares in the midst of all those stars and very nicely done too. 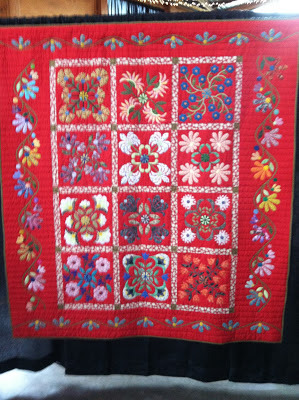 Though the colors are pretty bright, it was all needle-turned applique which I appreciate. And the bright works for this one. I love the top center square for some reason. 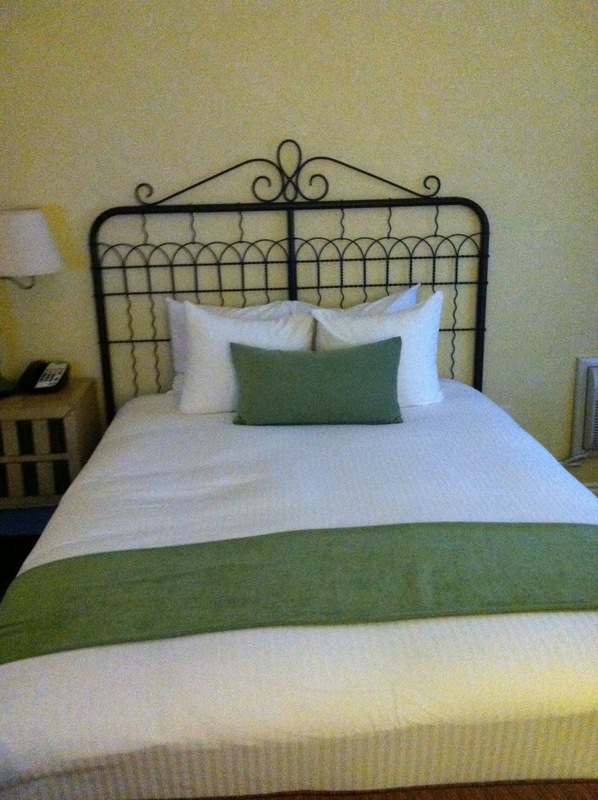 Our room was beautiful complete with fireplace. 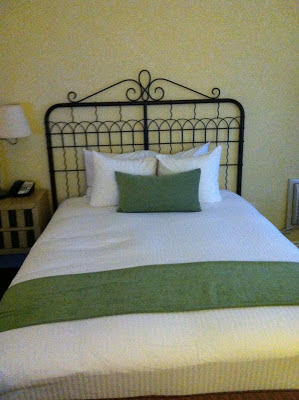 I like the garden gate head boards - very appropo for a garden resort. Here is one shot of a portion of the garden. We were at about the farthest point when it started to sprinkle. By the time we made it back, we were drenched so needless to say we didn't take many pictures along the way. I didn't take a picture of my toes, though they look so nice as I shove them into my woolly socks and warm shoes. We have about 8 inches of snow to trudge through around here. I am so thankful. 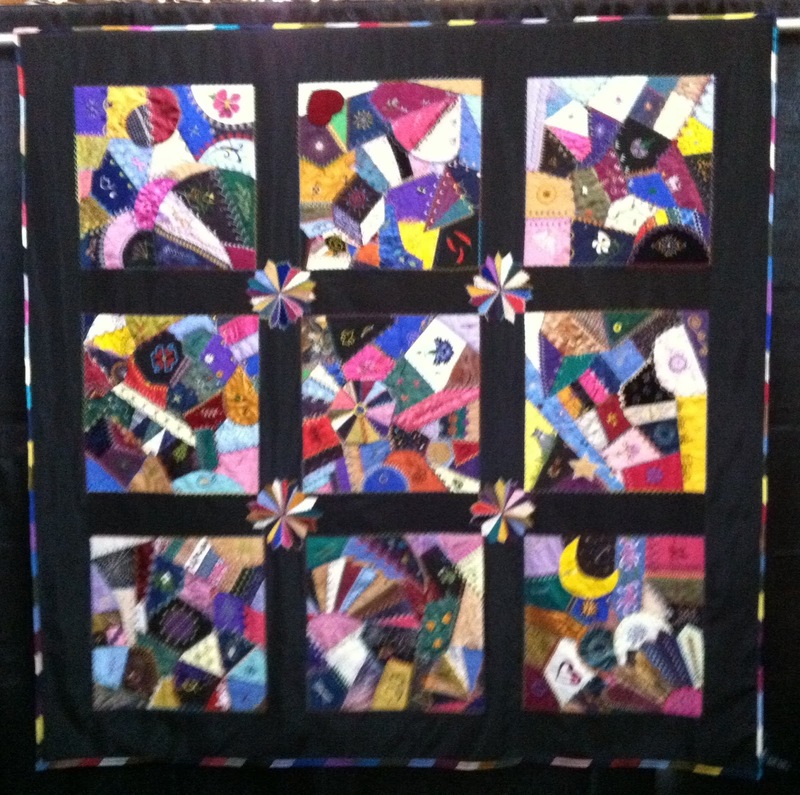 This was a wonderful quilt show and weekend. I didn't even know about this show or this place before this trip. The internet is an asset in as many ways as it can be a detriment. 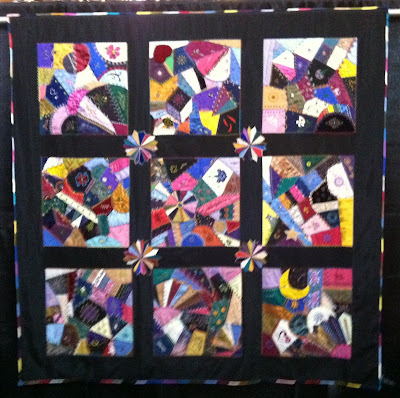 We're so glad you were able to visit the quilt show and enjoyed your stay at the Resort! We hope you'll come back again next year, for the 7th annual event. Guess what......CONGRATULATIONS!!!!!! You won ANOTHER GREAT PRIZE besides the absolutely FABULOUS Trip you posted about today! You are the winner of my Grow Your Blog Party Favor! So, you will receive the two bottles of Sheffield Cider, a goblet to drink it from, while having a bubble bath with the Lavender Bubble bath and body goodies I am sending with the Sparkling Cider! Please send me your address so I can get it in the mail! I am going to do a specific blog post about it with a picture of all the items and post it tomorrow. Hopefully I will get the package in the mail on Monday. I have a few things to mail and so it should work our great then. I will let you know when it is sent. Also, I love your blog! 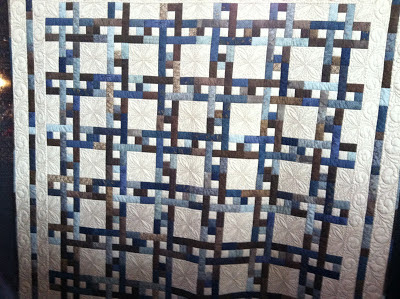 I have been wanting to do crazy quilting for a LONG TIME! 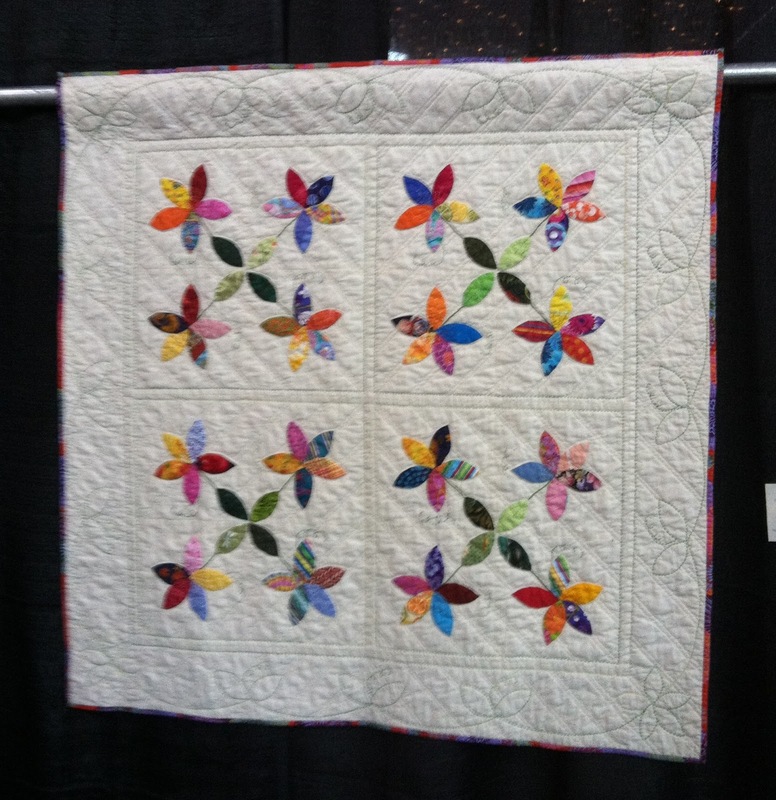 Oh, please let me know when this Quilt show happens again next year! I would love to go to one and Oregon is not so very far from me! HOpe to hear from you soon!